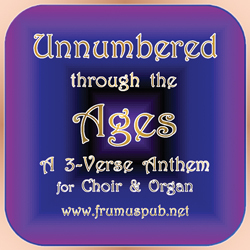 Fruhauf Music Publications announces a complimentary publication, Unnumbered through the Ages, an expanded three-verse hymn anthem for SATB choir and organ. Conceived in an Anglo-Catholic tradition, text and music combine in a manner suitable for All Saints as well as the seasons of Epiphany and Pentecost. This is the first of three verse anthems to be published by Fruhauf, and it is the most adventurous of the set, featuring the organist as a soloist and accompanist.